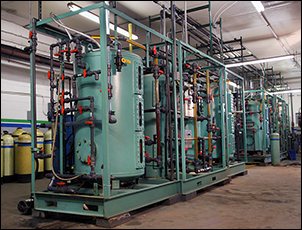 All Service Deionization systems and tank exchange services provide clients with an economical and effective high purity water solution. One of the unique benefits of All Water Systems is that we take time to fully understand your water needs from the quantity you use to the application and quality level of treatment you require. Combine this with our years of deionization experience and you get the right solution and a partner who will monitor your systems to proactively keep you up and running. We customize each service deionization system and exchange service to meet your needs, not our schedule, and we specialize in emergency service. We not only design the right system but monitor your systems and usage to know when something needs replacing through a schedule. Our systems feature indicator lights to alert you when an exchange is needed and can be typically replaced within 28 hours on average. Our service deionization and exchange tanks provide you with a structured system for handling, monitoring, and exchanging to ensure your high purity water demands are met without downtime or loss of water quality. Simply stated, our experience can take one less worry off your shoulders when it comes to service deionization. For More Information on Service Deionization and Exchange Tanks, call (412) 824-6560, or click here to contact us.